The opening game of the pro basketball league B.LEAGUE B1 was held on October 4 at Funabashi Arena in Chiba. 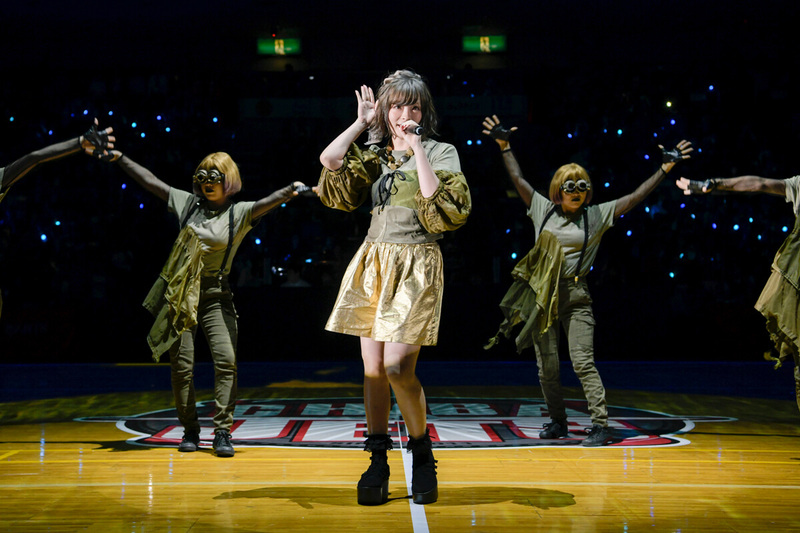 During halftime, Kyary Pamyu Pamyu made a surprise appearance to sing Kizunami which evoked huge cheers from the crowd that echoed through the packed-out arena. The song is taken from her new album Japamyu which recently dropped on September 26 and serves as the main theme song for the anime film Monster Strike The Movie: Sora no Kanata which released on October 5. The singer dropped the first surprise on everyone back in March when she announced a partnership with XFLAG™ Studio and was appointed as an official XFLAG Entertainment Partner. The company are responsible for delivering a string of media including video content, e-Sports and of course video game apps – one of which is Monster Strike which has a global user base of over 40 million. 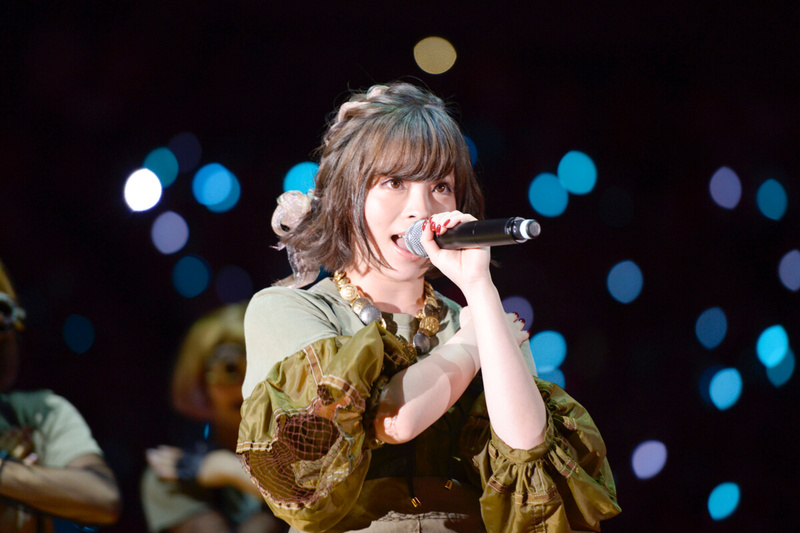 Kyary’s performance at Funabashi Arena is the second in a series of surprises. During the halftime show for XFLAG DAY a video was played with special messages from Japanese actor Masataka Kubota and actress Alice Hirose who play the main characters in the new Monster Strike movie. After talking about highlights of the movie and the theme song, Alice Hirose said, “There’s a lucky surprise for everyone gathered here today. Please welcome her with a round of applause!” upon which Kyary appeared on stage as a surprise guest. The crowd all lit up at once in a frenzy of cries and applause. As the arena turned to black, projection mapping was used on the basketball court below which was made to look like the floating world of New Tokyo in the movie. The wristbands given to each person in the crowd all glowed in time with the start of the performance, pulling people into another world and making them forget they were sat in a basketball court. 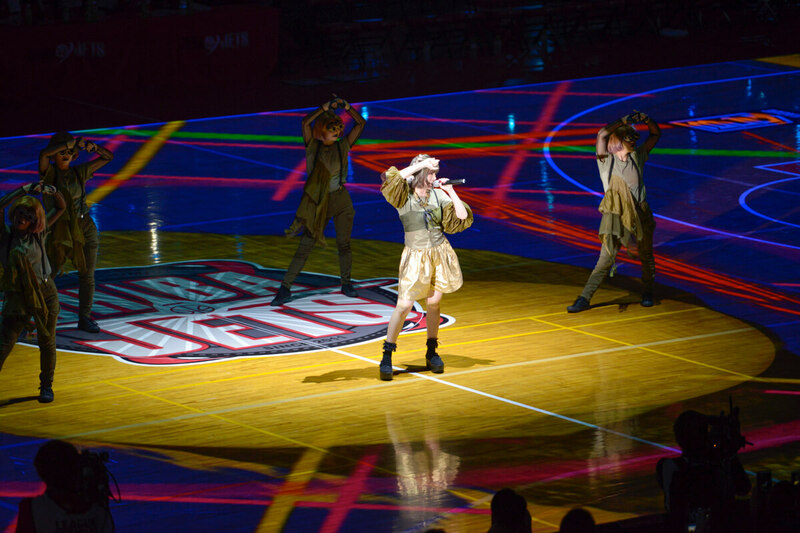 Four dancers joined Kyary on stage, who was wrapped in a visual kaleidoscope on the court. After the performance, Kyary had a message for the Chiba Jets fans gathered at the arena: “Please be sure to cheer them on in the second half too! I’ll be cheering too!” After a final round of claps, Kyary left the stage.